DAVOS, Switzerland (CNN) -- David Cameron, the leader of the UK's opposition Conservative Party, is discussing whether economic growth should be pursued at the expense of the environment. 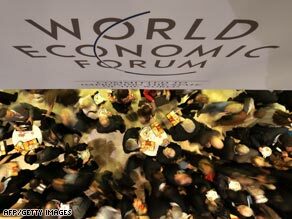 Social networking Web sites have added a new dimension to this year's World Economic Forum. "We've got to make sure that growth and the environment are not alternatives but they go together. We need green growth," Cameron says at the World Economic Forum, the annual gathering of powerbrokers and opinion shapers in the Swiss ski resort of Davos. But Cameron is not speaking from a stage or from behind a podium but straight into a webcam. And the question comes not from a suited delegate but from a YouTube user identified only as 86fleur. This has been the year when social networking truly arrived at Davos with YouTube, MySpace and Facebook all running initiatives which attempted to bring their audiences right into the heart of the debate. CNN too solicited questions from bloggers, Web users and TV viewers to ask our guests during our daily coverage. YouTube and MySpace both sent "citizen reporters" to cover the five-day meeting on behalf of their users while Facebook has been running live discussions and polling during several sessions with the results and feedback updated in real time on a big screen inside the conference hall. "We have 150 million people on the site and the conversations that are happening here are the exact same ones that happen on Facebook every day," said Randi Zuckerberg, who has been running the social networking site's Davos campaign. "So the challenge was, how do you involve all these people in these conversations that are happening with world leaders? Zuckerberg said that last year's U.S. election had brought social networking into the mainstream, with candidates forced to go beyond traditional media channels in search of new voters. "The candidates really had to go one step further to engage other constituents," she told CNN. "I'm really seeing it here now with global leaders and business leaders. They realise it's not enough to just discuss these issues in a vacuum. It has to be a discussion where you reach the people who support you or use your products." Pablo Camacho, a student from Bogota, Colombia, was chosen from among 250 participants in YouTube's "Davos Debates" to attend the forum as a citizen reporter. "It's a very interesting and ambiguous term because I'm not really a citizen because I am here at Davos and I'm not really a reporter because I'm not a journalist," he told CNN. He said social networking initiatives at gatherings like WEF helped to generate " a more democratic and horizontal" discussion. "I'm the exception here because I'm not in a powerful position and my job is really to use the freedom that I have to report things anyway I want. It's the minority that comes here to talk -- I remind them that when they get out the majority is the wider public." Camacho conceded that Web sites such as YouTube were partially invited to participate at Davos because it was "the hip thing to do" but said he had also seen genuine recognition of the importance and potential of social networking. "It is a fashion of course, but there is also a clear and authentic consciousness of what social networking could do and should do," he said. And with many delegates here coming from an older demographic than the archetypal social networker, Zuckerberg said Web sites such as Facebook and YouTube offered businesses and politicians a way of reaching a younger, socially and globally engaged generation. "When you look at the audience you can really see this eureka moment in their eyes when they see 2,500 responses come in three minutes," she said. "It's been really interesting to see how Facebook users are guiding some of these discussions and the way that global leaders are now looking at this as a place for insight and to get a real time pulse."